Italian Carnival is beloved by children of all ages. The word derives from the Latin “carnem levare”, which means to eliminate the meat. This refers to the fact that after Carnival comes the Lent fasting period. Carnival begins on a date between Epiphany (January 6) and Candlemas (February 2). Anyway, Patisseries and Supermarkets start to sell Carnival pastries on January 7. 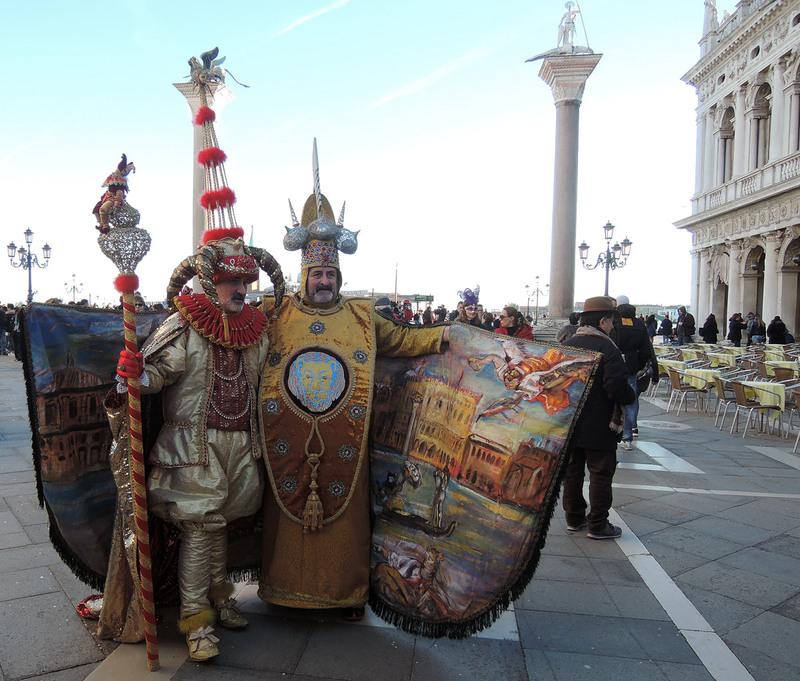 Once, during Carnival almost everything was allowed in Venice. People could put a mask on and feel free to be who they wanted to be. And then celebrate, dance, flirt, make pranks, even mock aistocrats and authorities. As for me, when I was a little girl Carinval meant first of all that for one day I could go to school and have fun. We kids went to primary school all dressed up in our costumes: at that time there were many cowboys, Harlequins, Zorros, clowns (HELP! I’m scared of clowns), fairies, princesses. Each could bring something to drink or eat. We were even allowed to bring confetti or streamers. I think confetti were banned at some point. Some schoolmates (always the boys) brought also some Carnival tricks like stink bombs, disgusting candies (forerunners of Harry Potter’s Every Flavour Beans, even if these had only one main ingredient: garlic), fake spiders or worms, fake poop and my favourite: the fart cushion. I was a pretty silly kid, so I had so much fun whenever we succeded in putting that cushion under somebody’s bum without beeing noticed. Another thing I loved were the floats parades. They were coloured, funny, full of people cheering along the street. And most of all I was free to “dirty” throwing the confetti. My mother was quite a cleaning and order maniac. I couldn’t touch aything at home. So Carnival was a liberating period for me. A: Angel as in Flight of the Angel During a mid-sixteenth century Carnival, an extraordinary event was organized for the first time: a young Turkish acrobat walked on a rope stretched between a docked boat and the St. Mark’s bell tower. Then, he reached the Palazzo Ducale balcony and saluted the Doge. Given the enormous success, the show, called Turkish flight, was repeated every year since then, with variations and different acrobats. For several years the selected acrobat was equipped with wings, lifted and then sent down at high speed sustained by the rope. So the performance was named the Flight of the Angel. In 1759, the show ended in tragedy. Since then the acrobat was replaced by a wooden dove and thus the name changed again becoming the Flight of the Dove. B: Bauta [bah-UH-tah]: Used especially since the eighteenth century, and still in vogue, it is the most famous Venetian disguise, worn by both men and women. It consist of a white mask, called larva, a black cocked hat and completed by a large black cloak called tabarro. 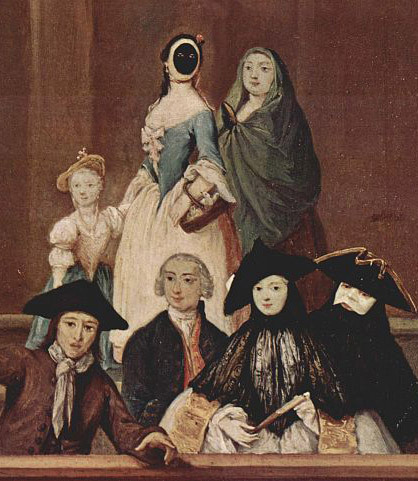 The Bauta was used not only during Carnival, but also at the theatre, parties, or whenever a person wanted the freedom to woo or be wooed, maintaining anonymity. The peculiar shape of the mask allows to drink and eat without taking it off. C: Carri mascherati (Carnival floats) in many cities and even small villages are held several parades with more or less sumptuous floats. These events are cherished by kids who attend the parades dressed as Spidermen, princesses, Peppa Pigs, etc and armed with dangerous confetti. The most famous floats parade in Italy is that of the Viareggio Carnival, in Tuscany. The participants work all year long to create their masterpiece paper-pulp floats, often portraying (clearly in order to mock them) politicians and other celebrities. E: Escapades or pranks. Venetian Carnival reached its greatest splendour in the eighteenth century, the epoch of Casanova. During Carnival 1745 precisely Giacomo Casanova and a friend spotted a beautiful commoner drinking with her husband and two friends. They immediately decided to organize a prank. They introduced themselves as public officials and imposed the three men to follow them to the island of San Giorgio. Left the men behind, they came back and accompanied the woman to the ‘Do Spade’ inn (Two swords, still existing) where they dined and well.. had fun with her all night. F: The Feast of the Marie in Venice. On the day of the purification of Mary, February 2, it was custom to accomplish the benediction of 12 brides, chosen from the poorest and most beautiful in town. The noble families had to contribute to create the brides dowry and the damsels could enjoy a sumptuous wedding at the presence of the Doge, a banquet and a parade on board of the Bucintoro, the Doge’s galley. In 943, during the celebrations, some Istrian pirates broke into the church and kidnapped the brides. The Doge led an expedition and reached the pirates near Caorle, killed all of them and retrieved the girls. That place in which this happened was called Porto delle Donzelle, Damsels Port, now Porto Santa Margherita. G: Galani and Frittelle Just like at Christmas we Italians have two different traditional cakes, Pandoro and Panettone, during Carnival we are torn in two between different sweet treats: frittelle and galani. Frittelle are a sort of doughnuts. Sometimes filled with custard or raisins. Galani are rectangles of fried dough. Usually, frittelle lovers say to galani lovers that they don’t understand anything, and vice versa. For the record I prefer galani, but don’t tell around 🙂 Once there was in Venice an actual guild of the fritoleri, people who produced frittelle. H: Hotel Be aware that the Carnival period is considered “altissima stagione” (very high season) in Venice so the prices are super expensive. I: Ivrea‘s Carnival is known for the Battle of Oranges. The origin seems to be an ancient rebellion against the city tyrant. L: Laws Carnival gave the opportunity to people to conceal their identity. So some spiteful persons had the opportunity to perform a series of misdeeds, more or less serious: muggings, robberies and harassment. For this reason authorities in Venice had to introduce some limitations and sanctions against abuse of disguises. M: Moretta is another Venetian disguise once used by women. It consists of a small black velvet mask, also called mute maidservant. Why? Since it wasn’t provided with a lace, in order to hold it, women had to bite a a button stitched on the rear side. N: Napoleon At the end of eighteenth century, with the French occupation by Napoleon before and the Austrian occupation later, the Carnival celebrations in Venice were interrupted. They were restored only in 1979 and now they last only 11 days. The Feast of Marie was restored in 1999 but it is more similar to a beauty contest now. No brides, no dowry. The Flight of the Angel has also been restored. It is now performed on the first Sunday of the celebrations, as an opening act. This year the Angel will be 2015 Marie contest winner, Irene Rizzi. O: Origin: The origin of Italian Carnival dates back to the Roman celebrations called Saturnalia, in honour of Saturn. The Romans believed that, during winter, when the fields were fallow, the underground gods would come out of the ground. In order to please them and appease their rage and to favour the summer crop, Romans organised feasts, sacrifices and banquets in their honour. These celebrations allowed a subversion of the social order and rules: slaves were temporarily free, for example. 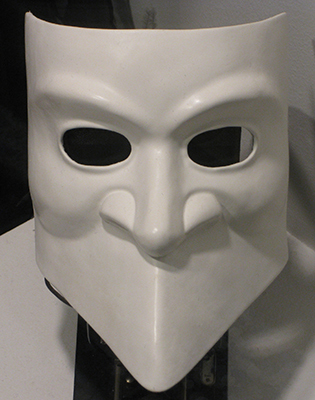 P: Pantalone is one of the Venetian masks. Yo can recognize him by his red overalls and black cloak. He is rich, erudite, stingy and often forced to pay other people’s debts. My father, when he has to pay a tax or something, always utters in Venetian dialect: “Xè sempre Pantalon che paga!” (It is always Pantalone who pays). On Frasier’s Crane fridge you can spot a Pantalone drawing. I don’t know why!! I noticed it watching a few episodes lately (DVD). Q: Quaresima, Lent, is the period that starts immediately after Martedì Grasso (Mardi Gras). In Italian it means Fat Tuesday and it is the last day of Italian Carnival. During this day people could eat all the most delicious foods left at home, before the Lent fasting period (nowadays I don’t know how many people still observe this rule). S: Stelle filanti (shooting stars in Italian, i.e. streamers) and Coriandoli (confetti) are the beloved by children who throw them in the air and at the parents/relatives/passersby. During the Middle Ages in Italy people used to eat coriander seeds (hence coriandoli) covered with sugar. In the same period, the nobles used to throw these coriander candies, flowers and small fruits in the air during parades and festivities. The commoners, who could not afford candies, used little chalk pieces instead. At some point, to economize, the chalk was replaced by paper. The word confetti in Italy means Jordan Almonds. They’re probably the evolution of coriander seeds (replaced by almonds) dragées. Confetti nowadays are given as a present in occasions such as christenings, weddings, graduations, etc. T: Travestimento, meaning disguise. The most popular Italian Carnival masks have different origins. Some derive from puppet theatre, others from the commedia dell’arte, others have ancient origins and some have been invented specifically as a symbol of Carnival in a particular city. The most famous Venetian masks are certainly Pantalone and his clever servant Colombina. Arlecchino, Harlequin, comes from Bergamo but works in Venice as a servant. U: Una delle ultime sere di carnovale, One of the last Carnival evenings is the title of comedy by Carlo Goldoni, Venetian XVIII century palywright. This comedy represents his farewell to Venice, before leaving for Paris. V: Venezia The Carnival of Venice: Its first evidence dates back to 1094, found in a document by Doge Vitale Falier, speaking of public entertainments and mentioning the word Carnival for the first time. It was a period of festivities, useful to the Republic to give humble classes something to keep them happy. At that time Carnival lasted 6 weeks, from December 26th to Ash Wednesday. During this period, all kinds of attractions were organized throughout the city, especially in Piazza San Marco: musicians, dancers, acrobats, jugglers, animal shows, puppets shows. Great balls were hosted by noble families in the most sumptuous palaces. Thanks to the use of masks, anonymity was granted and so also the possibility for the people to obtain a sort of levelling (no social divisions). When two masked people met they greeted saying: “Buongiorno, signora maschera!” (Good morning Ms. Mask). The mascareri, craftsmen who made masks, were officially recognized as a guild on April 10, 1436. Z: zabaione (zabaglione in English). It is one of the most popular fillings for the frittelle. I don’t like it because of its alcoholic taste. And remember, a common Italian Carnival way of saying is “A Carnevale ogni scherzo vale”. It means “During Carinval you can make every prank you like”, so be prepared!